Since the year 1097, the Rialto Market has been the main fish, fruit and vegetable market of Venice. 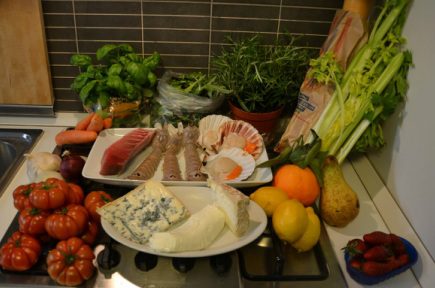 Even if you are not in a position to cook for yourself, the Rialto Mercato is a must-see sight of Venice. Here you will find a huge and beautiful fish market brimming with live catches and exotic varieties - crawling crabs and swimming eels - as well as a green market offering a rainbow of fresh fruits and vegetables, some from the Venetian island of Sant' Erasmo, all nestled into two squares on the edge of the Grand Canal. People may call Piazza San Marco the "center", but Rialto is the stomach of Venice. When to go: Go as early as you can. The bustle of the market begins in the pre-dawn hours as workers and vendors unload the fish, fruits and vegetables for display. Soon thereafter, the owners of the butcher and specialty shops surrounding the market open their doors for the day. By 8 AM chefs and restaurant owners descend on the market to select which fish to serve that evening. By midmorning the market is quite crowded and hectic. How to Get There: There are many ways to get to the Rialto Mercato. The easiest way is to take the Vaporetto number 1 to the Mercato stop. The stop is immediately adjacent to the market. From San Marco: Those staying the San Marco district may find it fastest to walk over the Rialto bridge. If you walk across the bridge, you can turn right into the Campo San Gioccomo di Rialto and then proceed into the vegetable market and on to the fish market. From Cannaregio: If you are staying in the Cannaregio district, go to Campo Santa Sofia, off the Strada Nova, and take the traghetto Santa Sofia which will let you off just outside of the fish market. From Other Areas: There are signs throughout the San Polo, Dorsoduro and Santa Croce districts indicating the direction of Rialto. Signs that say "Rialto" indicate the direction to the Rialto bridge and the Market. Casa Del Parmigiano, 214 San Polo, In Campo Battisti. 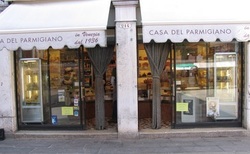 Casa Del Parmigiano is a wonderful cheese shop only a short distance from the Rialto vegetable market. They also sell cured meats and olives. The helpful and cheerful staff there will assist you with figuring which of the many gourmet cheeses they offer is most suited to your taste even if you are not already familiar with Italian cheeses. You can learn more on their website. Drogheria Mascari 580 San Polo, On Ruga Speziali. Drogheria Mascari, one of the best specialty food shops in Venice, is located inside an old fashioned druggist shop near the Rialto Market. 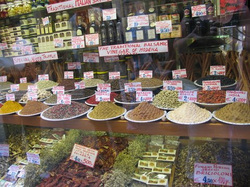 They specialize in Italian wines, sweets, vinegars, olive oils and dried herbs. In their backroom, you will find hundreds of regional wines and a large selection of liquors. The shop is well known among local chefs for its fresh and potent herbs and spices. A must if you plan to cook for yourself while in town! The herbs are sold in increments of 100 grams. This may look like a lot when you open up the paper pouch they'll give you, but you can bring them home with you and they do keep well. You learn more about all the wonders of Mascari on their website.